Nuclide allows many of the features to be used with the keyboard. Remember that Atom has many more shortcuts beyond what Nuclide offers. To see a complete list of hotkeys, take a look at Packages > Settings View > Show Keybindngs. Toggles the Outline View for a supported file so you can easily navigate to class and function definitions. In projects such as Hack or Flow, this will allow you to find all the references to a selected, highlighted entity in your project. Allows you to search for Hack function, classes and constants within you Hack project. Display the window showing you messages about your code. Possible messages include lint, compiler errors, etc. Nuclide can fix certain types of problems for you automatically, including various lint problems. This will allow all those to be fixed in the current file. Go to the first diagnostic. Go to the last diagnostic. Go to the previous diagnostic. Go to the next diagnostic. Expand all the directories from the current to the final directory child. Collapse all the directories to the top parent. Collapse the entire Project Explorer’s File Tree to the root. Remove a file or directory from the tree. You will be prompted first to avoid accidental mistakes. Toggles whether the Project Explorer’s File Tree is shown. Move the selection to the very top of the Project Explorer’s File Tree. Move the selection to the very bottom of the Project Explorer’s File Tree. Opens the selected entry in the Project Explorer’s File Tree. If a directory is selected, then the directory is expanded. If a file is selected, then the file is opened in the main Editing Area. If a file is selected, it opens the file in the bottom pane. If a file is selected, it opens the file in the right pane. If a file is selected, it opens the file in the top pane. If a file is selected, it opens the file in the left pane. Shows the file that is currently active in the main workspace in the Project Explorer’s File Tree. Toggles the focus of the current active file. Use this for a global search of anything within your project, including all files, currently open files, etc. This lets you switch between files that are currently open in the editor. Useful for quickly accessing files if you have a bunch of files open. This will show you files that you have recently opened and used in previous sessions of Nuclide. This allows you to search for files based on patterns. Find files related to the current file. A file is related if they have the same basename, but a different extension, for example. Toggle the developer tools UI. After stopping at a breakpoint, and possibly stepping through code, this will enable debugging to continue to the next breakpoint or end of the process. After breaking at a certain position or breakpoint, it will continue to cursor location. If a breakpoint is set, this will unset that breakpoint and vice-versa. Step over a piece of code. For example, if you are stopped at a method call, this will execute that method without stepping through it line-by-line. Step into a piece of code. For example, if you are stopped at a method call, this will go into the first line of that method. If you have stepped into a piece of code, this will step out to the point on which you entered that piece of code. For example, if you stepped into a method, this will step out back to the method call itself. Restart the current debugging session with the same configuration settings. Moves the currently active file in the editor to a bottom pane. Moves the currently active file in the editor to a right pane. Moves the currently active file in the editor to a top pane. Moves the currently active file in the editor to a left pane. When using Hyperclick, this will confirm the Hyperclick action you want to take. Toggle the Nuclide Health tab, which show details about the Nuclide process itself (how much CPU, memory is being used, etc.). Copy the relative path of the current file to the clipboard. Copy the absolute path of the current file to the clipboard. Copy the relative path of the current file starting at the root of the Mercurial repository. 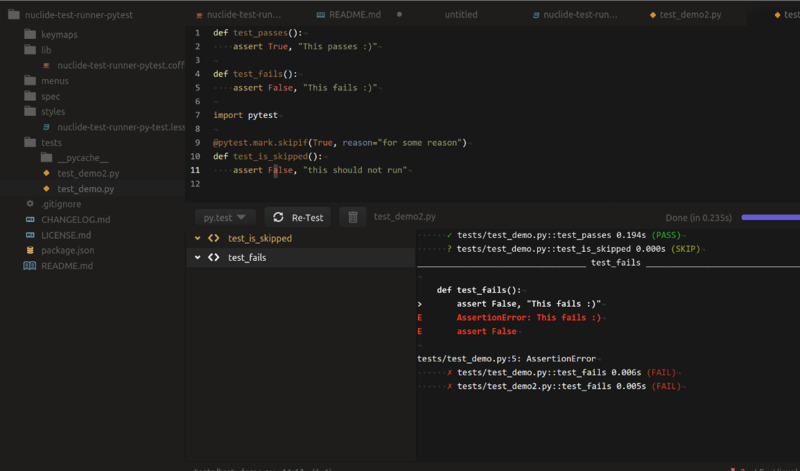 Nuclide is a collection of features for Atom editor. It installs on Atom provides IDE-like functionality for a variety of programming languages and technologies. What is your favorite Nuclide (Mac) hotkey? Do you have any useful tips for program? Let other users know below.